*Above photo: Christiana Figueres, the moving force behind the Paris Climate agreement, delivers the 2019 Peter M. Wege Lecture on Sustainability at the University of Michigan. 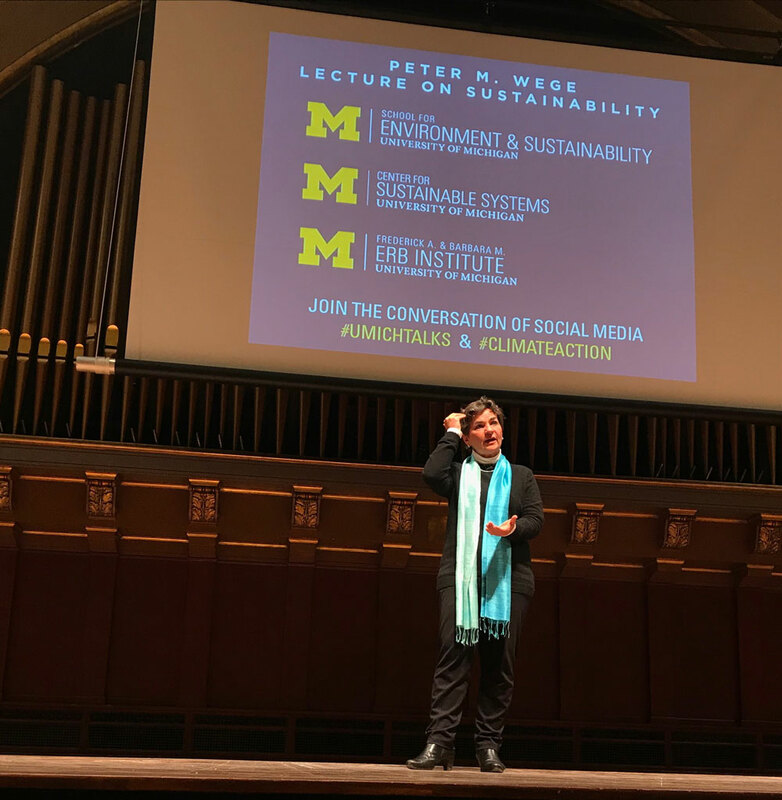 Christiana Figueres, the woman recognized worldwide as the “architect” of the Paris Climate Agreement, gave this year’s Peter M. Wege Lecture on Sustainability at the University of Michigan March 14. What this enthusiastic Costa Rican calls her own “stubborn optimism” enabled her to bring leaders of 196 countries together for the Paris Climate Conference in 2015. The outcome was the Paris Climate Agreement to keep global temperature rise below two degrees Celsius. Disappointed as Figueres is that President Trump has announced the United States’ intent to pull out of the Paris Agreement, this dynamic leader remains hopeful. “Climate change must be approached with a positive attitude,” she told the full house audience in the Michigan League’s auditorium. This daughter of a former Costa Rica president supported her optimism by noting that while China often gets blamed for its air pollution, the fact is the Chinese government has already exceeded its promised Paris Agreement goal. And India, with the world’s second highest population, has committed to having all electric vehicles within three to five years. Figueres noted that the patent office is a good place to look at the future. And new patents applications are coming in for innovations related to electric and solar energy, not fossil fuels. As for America’s expensive electric Tesla cars, the 2019 Wege Lecturer said the company “is on the right track.” But the need is to build more affordable electric automobiles. She offered five easy things all Americans can do to fight climate change. Cut back on eating beef. Buy local foods that don’t require fossil fuel to transport. Sell any high-carbon stocks you own and use the proceeds to buy into renewable-energy companies. 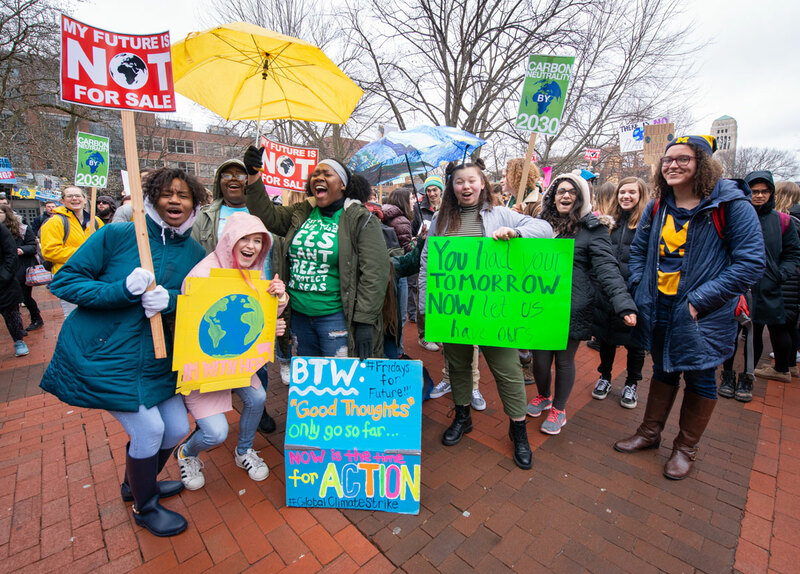 “For heaven’s sake VOTE!” And support the student strike that happened the next day on the Michigan campus as they did around the world to support global carbon neutrality. Friday March 15 young students in some 100 countries around the globe left their classrooms in a common march to save their futures from the disastrous consequences of climate change. These protesters on the Diag at the University of Michigan were some of the 300-plus people who joined the Ann Arbor protest. 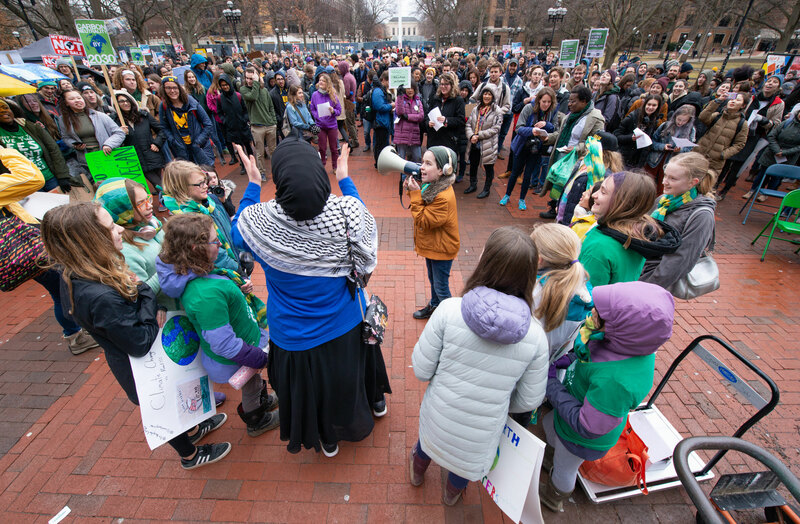 The speaker with the bullhorn in this photograph from the protest on the Diag against climate change confirms the youthfulness of this global movement on March 15. It was started by 16-year-old Swedish student Greta Thunberg. One of their signs reads: Why Go To Class When The World Is Burning?